EVE Online is a massively multiplayer game where tens of thousands work, compete, play and fight in a dark and dangerous sci-fi world. It's a beautiful place, and is about to become absolutely gorgeous. This winter we will be releasing the Trinity expansion. 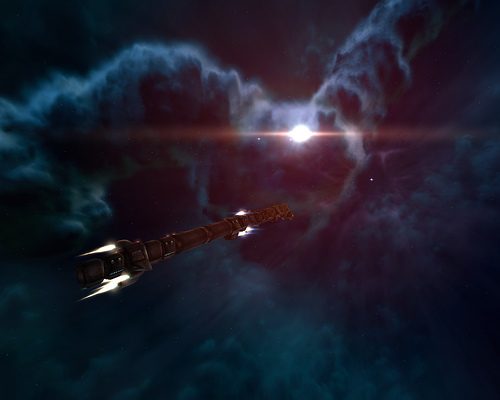 This constitutes a massive change in the world of EVE: Not only is the expansion packed with new features, but it also includes a graphics update of gargantuan proportions. Every ship, station and stargate has been completely overhauled from start to finish, resulting in an amazing splendor of spacefaring sights. It really has to be seen to be believed, and once Trinity arrives and you log on to EVE, we're convinced that you will never look back. 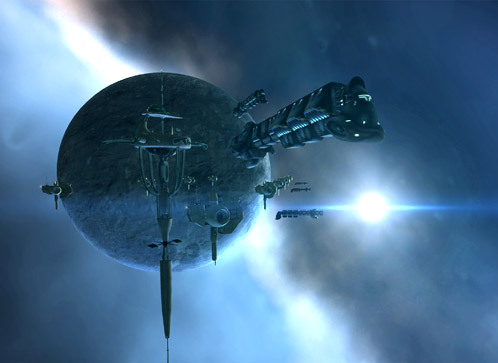 The playing environment in EVE Online consists of over five thousand star systems, almost all of which can be visited by the player.Each solar system is connected to other systems by one or more stargates, and in this way neighboring systems are organized into constellations and constellations are in turn organized into regions. In total there are 64 regions. The central regions make up most of the so-called high-security space with some low-security systems in between. Surrounding these are regions with no security, or 0.0 (zero-zero).. In some solar systems a player might be alone. In others more than 600 players might gather, e.g. for a fleet battle or to use a trading hub. Different systems contain different types of celestial objects, making them more or less suitable for different kinds of operations. In a typical solar system the player will find asteroid fields, stations, and moons, the latter two most often orbiting planets. Planets themselves are currently not explorable; however, players can use moons to anchor their parent corporation's structures for production and research or for moon mining. Asteroid fields can be mined for minerals. Other objects that can be found in systems are the aforementioned stargates, complexes or static dungeons for exploration. Occasonally a player may even stumble across a historic site, e.g. one where another player's Titan-class ship was destroyed and the wreck now floats in space. Combat in EVE is a mixture of both tactical intelligence and spontaneous decision-making using a point-and-click interface. While every race has certain tendencies for different battle tactics, a character's combat capabilities are determined by skill levels, the ship being piloted and various hardware modules fitted into it. EVE's combat system allows ships of all sizes to be useful in combat. Large ships such as battleships are typically outfitted with heavy weapons allowing them to battle other ships of their size. Such weapons however do not have the accuracy to effectively damage smaller, faster ships like frigates.While a large ship can equip smaller weapons designed for attacking smaller targets, this leaves them at a disadvantage versus other large ships. Drones can also be used against smaller ships, or in a support role such as providing extra shield for a gang mate or in a utility role such as electronic warfare. Small ships such as frigates may be unable to do significant damage to larger ships on their own, but can greatly affect the outcome of small group battles by employing tactics such as disrupting the engines of enemies (reducing mobility or chance to escape) and jamming enemy sensors or by attacking a larger ship as a pack.